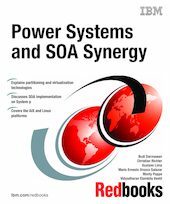 This IBM Redbooks publication gives a broad understanding of the synergy between service-oriented architecture (SOA)-based applications and Power Systems servers. The popularity and reach of SOA-based applications has grown exponentially in recent years. Enterprises are relying more on SOA-based applications for their operation. As a mission critical system, it is critical that the application be supported by an adequately planned infrastructure. IBM Power Systems have been leading players in the server industry for decades. Power Systems provide great performance while delivering reliability and flexibility to the infrastructure. Given the advent of SOA-based applications, this book aims to demonstrate what benefits a SOA-based application can get from a Power Systems infrastructure and how Power Systems support a SOA-based application. The book is intended as a guide for a Power Systems specialist to understand the SOA environment and for a SOA specialist to understand the facilities available for Power Systems supporting SOA-based applications.